While the war failed in its primary aim of regime change in Gaza, it left ­behind a trail of death, devastation, ­destruction and indescribable human suffering. Israel lost 13 people, three in so-called friendly fire. The Palestinian death toll was 1,387, including 773 civilians (115 women and 300 children), and more than 5,300 people were injured. The ­entire population of 1.5 million was left traumatised. Across the Gaza Strip, 3,530 homes were completely ­destroyed, 2,850 severely damaged and 11,000 suffered structural damage. The UN Relief and Works Agency for Palestinian Refugees, tending to the needs of four million Palestinian ­refugees, stated that Gaza had been “bombed back, not to the Stone Age, but to the mud age”; its inhabitants ­reduced to building homes from mud after the fierce 22-day offensive. War crimes were committed and possibly even crimes against humanity, documented in horrific detail in Judge Richard Goldstone’s report for the UN human rights council. The report ­condemned both Israel and Hamas, but reserved its strongest criticism for Israel, accusing it of deliberately targeting and terrorising civilians in Gaza. The British government did not take part in the vote on the report, sending a signal to the hawks in Israel that they can continue to disregard the laws of war. Gordon Brown’s 2007 appointment as a patron of the Jewish National Fund UK presumably played a part in the adoption of this ­pusillanimous position. One year on, the Gaza Strip, one of the most densely populated areas on earth, continues to teeter on the verge of a humanitarian disaster. Israel’s ­illegal blockade of Gaza, in force since June 2007, restricts the flow not only of arms but also food, fuel and medical supplies to well below the minimum necessary for normal, everyday life. Reconstruction work has hardly begun because of the Israeli ban on bringing in cement and other building materials to Gaza. Thousands of families still live in the ruins of their former homes. Hospitals, health facilities, schools, government buildings and mosques cannot be rebuilt. Nor can the basic ­infrastructure of the Gaza Strip, including Gaza City’s sewage disposal plant. Today, 80% of Gaza’s population ­remain dependent on food aid, 43% are unemployed, and 70% live on less than $1 a day. Meanwhile, the so-called peace process cannot be revived because ­Israel refuses to freeze settlement ­expansion on the West Bank. Prime minister Binyamin Netanyahu recently agreed to a temporary freeze of 10 months, but this does not apply to the 3,000 pre-approved housing units to be built on the West Bank or to any part of Greater Jerusalem. It’s like two men negotiating the division of a pizza while one continues to gobble it up. Politically, the disjunction between words and deeds persists. Appeals to the Israeli government to lift or relax the blockade of Gaza were not backed up by effective pressure or the threat of sanctions. In fact, the only effective pressure was applied by the US on the Egyptian government – to seal its border with Gaza. Egypt has its own reason for complying: Hamas is ideologically ­allied with the Muslim Brotherhood, the Islamic opposition to the Egyptian regime. The tunnels under the border separating Egypt from the Gaza Strip bring food and material relief to the people under siege. Yet, under US ­supervision and with the help of US army engineers, Egypt is building an 18-metre-deep underground steel wall to disrupt the tunnels and tighten the blockade. The wall of shame, as Egyptians call it, will complete the transformation of Gaza into an open-air prison. It is the cruellest example of the concerted ­Israeli-Egyptian-US policy to isolate and prevent Hamas from leading the Palestinian struggle for self-determi­nation. Hamas is habitually dismissed by its enemies as a purely terrorist ­organisation. Yet no one can deny that it won a fair and free election in the West Bank as well as Gaza in January 2006. Moreover, once Hamas gained power through the ballot box, its ­leaders adopted a more pragmatic stand ­towards Israel than that enshrined in its charter, repeatedly expressing its readiness to negotiate a long-term ceasefire. But there was no one to talk to on the Israeli side. Israel adamantly refused to recognise the Hamas-led government. The US and the European Union ­followed, ­resorting to economic ­sanctions in a vain attempt to turn the people against their elected leaders. This cannot ­possibly bring ­security or stability ­because it is based on the denial of the most ­elementary human rights of the people of Gaza and the collective political rights of the ­Palestinian people. Through its special relationship with the US and its staunch support for ­Israel, the ­British government is implicated in this shameful policy. At present the British public is ­preoccupied with Tony Blair and the war in Iraq. What is often ­overlooked is that this was only one aspect of a disastrous British policy towards the Middle East, inaugurated by Blair, and which shows no sign of changing under his successor. One of Blair’s arguments used to ­justify the Iraq war was that it would help bring justice to the long-suffering Palestinians. In his House of Commons speech on 18 March 2003, he promised that action against Iraq would form part of a broader engagement with the problems of the Middle East. He even declared that resolving the Israeli-­Palestinian dispute was as important to Middle East peace as removing Saddam Hussein from power. Yet by focusing international ­attention on Iraq, the war further ­marginalised the Palestinian question. To be fair, Blair persuaded the Quartet (a group consisting of the US, the UN, the EU and Russia) to issue the Roadmap in 2003, which called for the creation of an independent Palestinian state alongside Israel by the end of 2005. But President George Bush was not genuinely committed and only adopted it under pressure from his ­allies. Ariel Sharon, Israel’s hard-line prime minister at the time, wrecked the plan by continuing to expand Israeli settlements on the West Bank. Could Blair really not have realised that for Bush the special relationship that ­counted was the one with Israel? Every time Bush had to choose between Blair and Sharon, he chose Sharon. Israel’s withdrawal from the Gaza Strip in August 2005 was not a contribution to the Roadmap but an attempt to unilaterally redraw the borders of Greater Israel and part of a plan to ­entrench the occupation there. Yet in return for the unilateral withdrawal from Gaza, Sharon extracted from the US a written agreement to Israel’s ­retention of the major settlement blocs on the West Bank. Bush’s support amounted to an abrupt reversal of US policy since 1967, which regarded the settlements as illegal and as an obstacle to peace. Blair publicly endorsed the pact, probably to preserve a united ­Anglo-American front at any price. It was the most egregious British ­betrayal of the Palestinians since the Balfour Declaration of 1917. In July 2006, at the height of the savage Israeli onslaught on Lebanon, Blair opposed a security council ­resolution for an immediate and ­unconditional ceasefire: he wanted to give Israel an opportunity to destroy Hezbollah, the radical Shi’ite religious-political movement. One year later, in June 2007, he resigned from office. That day he was appointed the Quartet’s special envoy to Israel and the Palestinian Authority. His main sponsor was Bush and his blatant partisanship on behalf of Israel was probably considered a qualification. His appointment ­coincided with the collapse of the ­Palestinian national unity government, the reassertion of Fatah rule in the West Bank and the violent seizure of power by Hamas in Gaza. Blair’s main tasks were to mobilise international assistance for the Fatah-dominated Palestinian Authority, to promote good governance and the rule of law in the Palestinian territories, and to further Palestinian economic development. His broader mission, was “to promote an end to the conflict in conformity with the Roadmap”. On taking up his appointment, Blair said that: “The absolute priority is to try to give effect to what is now the consensus across the international community – that the only way of bringing stability and peace to the ­Middle East is a two-state solution.” His appointment was received with great satisfaction by the Israelis and with utter dismay by the Arabs. In his two and a half years as special envoy, Blair has achieved remarkably little. True, Blair helped persuade the Israelis to reduce the number of West Bank checkpoints from 630 to 590; he helped to create employment oppor­tunities; and he may have contributed to a slight improvement in living ­standards in Palestine. But the Americans remained fixated on security rather than on economic development, and their policy remains skewed in favour of ­Israel. Barack Obama made a promising start as ­president by insisting on a complete settlement freeze on the West Bank, but was compelled to back down, ­dashing many of our high hopes. One reason for Blair’s disappointing results is that he wears too many hats and cannot, as he promised, be “someone who is on the ground spending 24/7 on the issue”. Another reason is his “West Bank first” attitude – ­continuing the western policy of bolstering Fatah and propping up the ailing Palestinian Authority against Hamas. His lack of commitment to Gaza is all too evident. During the Gaza war, he did not call for a ceasefire. He has one standard for ­Israel and one for its victims. His attitude to Gaza is to wait for change rather than risk ­incurring the displeasure of his American and ­Israeli friends. 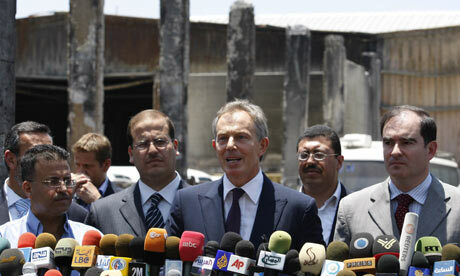 As ­envoy, Blair has been inside Gaza only twice; once to visit a UN school just ­beyond the border and once to Gaza City. His project for sanitation in northern Gaza was never completed because he could not ­persuade the Israelis to ­allow in the last small load of pipes needed. A growing group of western politicians has ­publicly acknowledged the necessity of talking to Hamas if meaningful progress is to be achieved; Blair is not one of their number. Blair has totally failed to fulfil the ­official role of the envoy “to promote an end to the conflict in conformity with the Roadmap”, largely for reasons beyond his control. The most ­important of these is Israel’s determination to perpetuate the isolation and the de-development of Gaza and deny the Palestinian people a small piece of land – 22% of Mandate-era ­Palestine, to be precise – on which to live in freedom and dignity. It is a policy that Baruch Kimmerling, the late Israeli sociologist, named ­”politicide” – the denial to the ­Palestinian people of any independent political existence in Palestine. Partly, however, Blair’s failure is due to his own personal limitations; his ­inability to grasp that the fundamental issue in this tragic conflict is not Israeli security but Palestinian national rights, and that concerted and sustained ­international pressure is required to compel Israel to recognise these rights. The core issue cannot be avoided: there can be no settlement of the ­conflict without an end to the Israeli occupation. There is international consensus for a two-state solution, but Israel rejects it and Blair has been unable or unwilling to use the Quartet to enforce it. This entry was posted on 05/02/2010 at 6:51 PM and is filed under Everyday life in Gaza, Gaza, Gaza reconstruction, Gaza war crimes investigation, Hamas, History, International community, International conferences, Israel, Israel politics, Israel's separation wall, Israeli occupation, Israeli politics, Operation Cast Lead, Palestine, Peace process, Siege, War crimes. You can follow any responses to this entry through the RSS 2.0 feed. You can leave a response, or trackback from your own site.